A fan told James Dolan to "sell the team" and he reacted by banning the man and playing all of his latest hits in a recent radio interview. The beleaguered Knicks owner's attempt to explain himself really just reminded us how far the team has fallen. 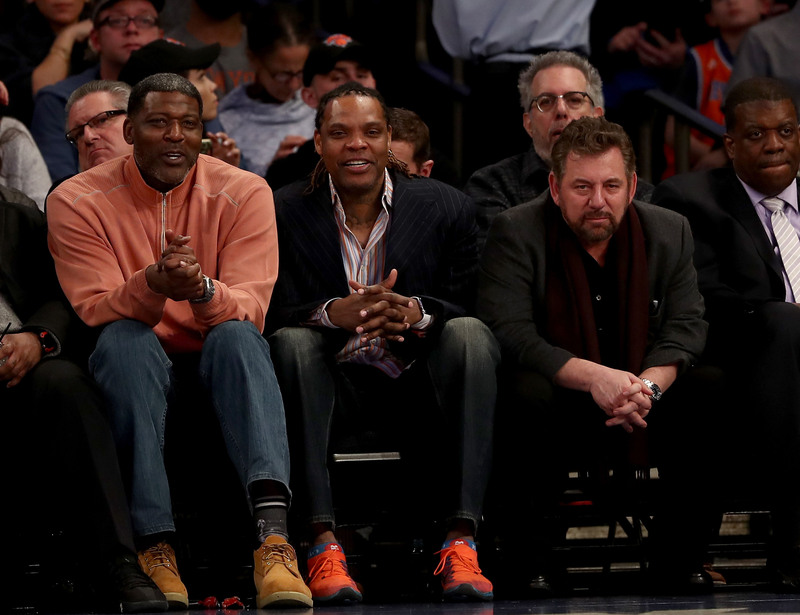 James Dolan wants you to believe he is the victim, that the mean fan with the critical tongue wounded him when he barked “sell the team” from the stands as Dolan slipped out of Madison Square Garden after yet another Knicks loss on Saturday. To the millions listening to a rambling, 45-minute train wreck of an interview Dolan gave to ESPN Radio on Tuesday, Dolan described an “ambush” he backed up by a Garden-supplied video that purportedly shows a Cersei Lannister-like scheme he alleges was concocted by a couple of guys looking to squeeze a few bucks out of TMZ with a video of Dolan blowing his stack. Host Michael Kay pushed back some on Dolan’s comments, but it’s hard to have a conversation with someone who looks down at a tuna sandwich and sees an ice cream cone. In discussing how he took a step back during the Phil Jackson Era, Dolan said, “When Phil was coming, everyone was elated.” Never mind that there was plenty of backlash to installing a career coach into an upper management position. When asked for more on the incident with the fan, Dolan said he originally planned to invite the fan back to “schmooze” with the team at the next game, to take him into the locker room to show him, “Hey, we’re doing very well. You are reading too much of the Daily News.” Never mind that the Knicks, 13-55 and about to miss the playoffs for a sixth straight season, have suffered through stunning levels of ineptitude during Dolan’s reign. You come to New York and you get the Garden, you get the city … and you get Dolan, the overseer of one of the NBA’s flagship franchises that has made five playoff appearances and owns one playoff win since 2001. Dolan, who hired Jackson when dozens of more skilled and experienced executives would have taken the job. Dolan, who wages war with the New York media—the Daily News, specifically—claiming, without offering evidence, that reporters covering the team have hidden agendas. Opinions can be split on Porzingis, who was offloaded to Dallas for a handful of players and a pair of first round picks, but the idea that anyone knows the decision was the right one is nutty. Porzingis has been mum on his end in New York, while the Knicks have spun a tale of a player who wanted out and had no intention of inking a long-term extension if he didn’t get his way. “When he came in and said, ‘I don’t want to be here. I’m going to leave the first chance that I get. I want to be traded,’ that kind of cast the die on what we had to do,” Dolan said. It should be noted that if Porzingis, who is eligible for the same max-level extension in Dallas that he would have been in New York, turns down a max offer in favor of taking a one-year qualifying offer, he will be the first player ever under these salary rules to do so. Dumping Porzingis positioned the Knicks to have cap room for two max-level free agents, and on this subject Dolan drifts into an alternate reality again. “Players who are free agents want to go to a winner and they want to get paid,” Dolan said. A winner? Kevin Durant will be courted by Golden State, this decade’s dynasty, and the Clippers, a buttoned up organization piecing together a remarkable rebuilding season. On Tuesday, Dolan peered down at his notes and wondered if the hosts knew just how many teams passed on Mitchell Robinson. Get paid? This isn’t baseball, and the Knicks can’t just jack up the MSG ticket prices and offer free agents a blank check. Kyrie Irving can get a fifth year in a long term deal with Boston—which will guarantee him around another $40 million. The Knicks may nab one or both of Durant and Irving this summer, but winning and money won’t be the reasons why. Dolan pat himself on the back on Tuesday, repeatedly, for staying out of the operations of the Knicks and NHL’s Rangers in recent years, but he forgot that what he does before stepping back—hiring the right people—matters even more. Dolan’s bizarre obsession with Isiah Thomas set the Knicks back in the early 2000’s and his decision to hire Jackson is why the franchise is where it is today. Instead of offering his millions to top tier executives like Masai Ujiri or R.C. Buford, he has handed the keys to the Knicks to those with splashy profiles and little to no front office experience; instead of mining the league for the next Dennis Lindsey or Jon Horst, he has let relationships influence who he puts in charge. James Dolan got his feelings hurt last weekend, and his reaction has drudged up all of his greatest hits. “Sell the team,” a fan said, and Dolan took it as cheap attempt at a cash grab rather than the voice of so many fans that have not seen a championship in their lifetime. It’s been nearly two decades since Dolan took over the franchise and this incident was a reminder that a championship has never seemed so far away.